Once your control system has been designed, our in-house manufacturing begins. Our panel shop can build control panels, AC or DC drive panels, junction boxes, solenoid panels, operator stations, and control consoles for any size installation. 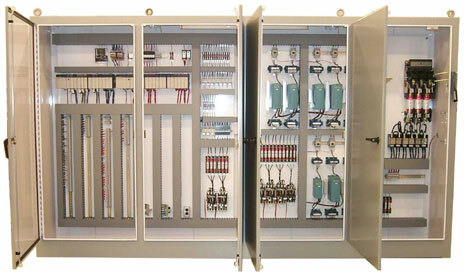 Your entire control system will be powered up prior to shipment to test all components and sensors. The software programs are then loaded so all system hardware and software can be qualified and tested. The engineering team then compares the test results to the original design criteria for compliance. This manufacturing concept ensures technical continuity from system inception to commissioning and right into production. Our engineers can provide phone support, onsite supervision, training, and commissioning services. Since we are staffed by engineers from the top down, there are several technical people who can assist in support at any given moment. During each phase of the project, your operations and maintenance personnel will have the opportunity to learn every detail of your new control system. They can be trained in formal classroom sessions or provided “On the Job” training. Additional support is only as far away as your phone. One call to PMC Systems Limited can confirm the ability of an engineer for phone support or even an on site service call. Our more sophisticated control systems allow PMC Systems Limited access over the Internet for troubleshooting, modifications, and upgrades. The PMC Systems Limited engineering and software team that designed your control system will be the same team that starts up your controls for the first time.